More than 100 million Americans have high blood pressure. The number of deaths associated with this condition increased by 38 percent between 2005 and 2015. If left untreated, hypertension can lead to stroke, coronary heart disease and other life-threatening illnesses. One way to bring your blood pressure down is to go on a low-salt, low-fat diet. The American Heart Association (AHA) recommends a maximum sodium intake of 1,500 milligrams to 2,300 milligrams per day. Yet, the average person consumes more than 3,400 milligrams of sodium daily. Approximately 75 percent of this amount comes from processed and restaurant foods. Sodium plays a key role in health and well-being. Along with potassium, calcium, magnesium and other minerals, it's one of your body's main electrolytes. These compounds maintain your fluid balance and support nerve function. Too much or too little sodium can affect your electrolyte balance and trigger a chain reaction in the body. When consumed in excess, though, this mineral can lead to high blood pressure, kidney stones, osteoporosis, stroke and cardiovascular problems. It also causes your body to hold onto water, which results in fluid retention and bloating. Over time, a high-sodium diet can damage your blood vessels and increase heart disease risk. High blood pressure contributes to chronic heart failure, heart attack and stroke. However, it's not the only culprit. A diet high in trans fats can affect your heart too. A 2015 review published in The BMJ indicates a strong link between trans fats and all-cause mortality. These fatty acids may put you at risk for coronary heart disease, cardiovascular disease, stroke and diabetes. Researchers point out that ruminant trans fats, which occur naturally in meat and dairy, are less harmful than industrial trans fats. These compounds increase bad (LDL) cholesterol and reduce good cholesterol levels. In the long run, high cholesterol may lead to atherosclerosis, stroke and heart disease. Excess sodium consumption raises your blood pressure, which only makes things worse. A low-sodium, low-fat diet could benefit those who are genetically predisposed to cardiovascular problems. If you have high blood pressure, elevated cholesterol or heart disease, it's even more important to tweak your eating habits. As the Harvard T.H. Chan School of Public Health notes, African Americans and people over age 50 as well as those with hypertension or diabetes are at higher risk of developing health problems due to excess sodium consumption. Sodium occurs naturally in beets, carrots, seafood, meat, eggs, dairy and other foods. A large egg, for example, contains 70 milligrams of sodium, which is approximately 3 percent of the daily recommended intake. One cup of raw beets boasts 106 milligrams of sodium, while Greek yogurt has 85 milligrams of sodium per cup. These foods, though, are much lower in sodium compared to pizza, crackers, pastries, smoked fish, cured meats and other processed products. Smoked salmon, for instance, has a whopping 1,700 milligrams of sodium per serving — that's 71 percent of the recommended maximum daily intake. So what can you eat on a low-salt, low-cholesterol diet? Many foods are not only delicious but heart-friendly too. Fresh, dried and frozen fruits are low in sodium and fat. One cup of sliced strawberries, for example, has only 1.7 milligrams of sodium and 0.5 milligrams of fat. Apples have 0.2 grams of fat and no sodium at all. For a more exotic flavor, choose pineapple — 1 cup provides 1.7 milligrams of sodium and 0.2 grams of fat. The only exception is avocado. A large one contains 14.1 milligrams of sodium and 29.6 grams of fat. However, the healthy fats in avocado support cardiovascular health. A 2018 meta-analysis published in The American Journal of Clinical Nutrition confirms that avocado provides cardiovascular benefits. Rich in monounsaturated and polyunsaturated fats, this fruit may reduce total and LDL cholesterol and triglyceride levels. Researchers suggest that it may also aid in weight loss. Broccoli, spinach, kale, cauliflower, lettuce and other vegetables are all low in sodium and fat — and pack a hefty nutritional punch. One cup of spinach has only 23.7 milligrams of sodium and 0.1 grams of fat. The same amount of kale boasts 28.8 milligrams of sodium and 0.5 grams of fat. Lettuce contains as little as 7.2 milligrams of sodium and 0.1 grams of fat per serving. 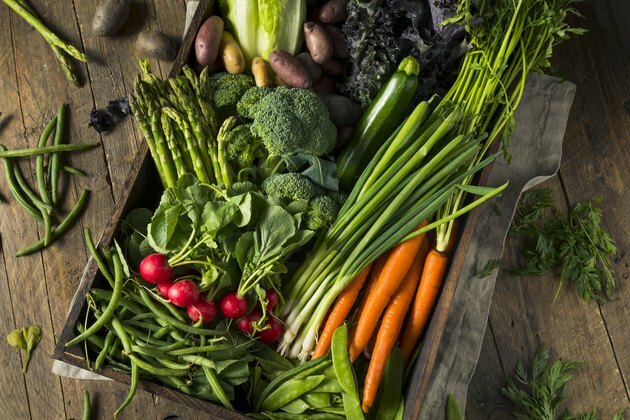 In 2017, the journal Nutrients published a review that highlights the benefits of eating more vegetables. These foods are rich in bioactive compounds with antioxidant, anti-inflammatory and cardioprotective properties. When consumed regularly, they may help prevent heart disease, reduce blood pressure and improve lipid metabolism. Fish isn't just an excellent source of protein — it also benefits your heart and keeps you lean. Even fatty fish is a good choice, thanks to its high content of omega-3s. Wild salmon, for example, provides 37 milligrams of sodium, 5.4 grams of fat and 47 milligrams of cholesterol per serving. As Mayo Clinic notes, salmon and other fatty fish are loaded with unsaturated fats that protect against heart disease. These nutrients fight inflammation, reduce blood clotting and may lower your risk of sudden cardiac death. If you prefer low-fat fish, opt for cod, halibut, haddock or pollock. There are only 60.4 milligrams of sodium and 0.5 grams of fat in 3 ounces of cod. Halibut contains 70 milligrams of sodium and 1.4 grams of fat per serving. Low-sodium canned tuna is a healthy choice too — just make sure you choose water-packed varieties. Whole grains may significantly lower the risk of heart disease in obese and overweight adults, according to a 2016 study published in The Journal of Nutrition. Subjects who consumed these foods experienced a 3 percent reduction in body weight, a 6 percent reduction in body fat mass and major reductions in both systolic and diastolic blood pressure. At the end of the study, their LDL cholesterol levels were up to 20 percent lower. Loaded with vitamins, minerals and dietary fiber, whole grains keep you energized throughout the day. They also contain complex carbs that are slowly released into your body without causing blood sugar spikes. Their low-fat and low-sodium content shouldn't be overlooked either. One cup of wheat, for example, contains 3.4 milligrams of sodium and 3.3 grams of fat. Oats have 3.1 milligrams of sodium and 10.8 grams of fat per cup. The same amount of cooked wild rice provides 4.9 milligrams of sodium and less than 1 gram of fat. Cheese, yogurt, milk and other dairy foods can be consumed as part of a low-salt, low-fat diet. However, some are quite high in fat and sodium. Six slices of mozzarella provide 38.8 grams of fat and more than 1 gram of sodium. A better choice is low-fat cottage cheese with no sodium added; 1 cup has only 2.3 grams of fat and 29.4 milligrams of sodium. To stay on the safe side, choose low-fat dairy foods over standard varieties. Be aware that some varieties, such as smoked cheese and Parmesan, are loaded with salt and saturated fats. If you have high cholesterol or high blood pressure, it's better to avoid them. American Heart Association: Excess Salt Is in More Foods Than You Think!